A healthy recipe. We loved the salmon cakes made this way. They turned out firm and slightly crispy on the outside. Very good! Using a fork, combine the salmon, scallion, lemon peel, 3 tablespoons plain Dannon Oikos nonfat Greek yogurt, 1 teaspoon mustard, and 1 teaspoon of the horseradish in a medium bowl. Add the wheat germ and celery and season with salt and freshly ground black pepper. Mix well. Coat a medium nonstick skillet with canola oil cooking spray and place over medium heat about 1 minute. Mix the capers, lemon juice, and oil in a medium bowl. Add the arugula and toss to coat. Transfer to a serving plate, forming a bed of the arugula mixture. Set aside. 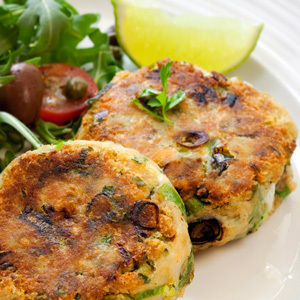 Divide the salmon mixture into 2 round patties, each 1/2? thick. Reduce the heat to low and add the patties to the skillet. Cook 2 minutes per side, then flip and cook 1 minute more, or until heated through and lightly browned. Place on top of the reserved arugula mixture. Combine the remaining 1/2 teaspoon plain Dannon Oikos nonfat Greek yogurt, 1 teaspoon mustard, and 1 teaspoon horseradish in a small bowl. Spoon on top of the salmon cakes.